Princess Haya has laid out her vision for horse sport as she seeks a second term as FEI president, saying she is seeking re-election consolidate the gains made in recent years. She proposes greater athlete representation, a move to commercial partnerships rather than sponsorship packages, closer ties with other horse sports and growing income streams. The presidency of the FEI will be decided at a meeting of national federations in Chinese Taipei early in November. The princess faces challenges from two European candidates, Swede Sven Holmberg and Dutchman Henk Rottinghuis, both of whom have criticised elements of the FEI's performance under her leadership. Princess Haya said she respected good governance and the strong values that celebrate the horse and horsemanship. She has laid out several pledges, including establisment of an FEI Solidarity Programme, based on the Olympic Solidarity model. Her vision includes greater athlete representation, with "full voting rights" at FEI executive board level, in addition to the creation of formal alliances between the FEI and racing, polo and other stakeholders. She wants to address transportation and quarantine challenges through plans for migration toward compulsory microchipping of equestrian sport horses, supported by the FEI, "while still allowing and celebrating the various breed brands". Also included are plans for the FEI's veterinary department to hub a fully fledged transport and quarantine section within it, to enable the FEI to ultimately ship the horses of national equestrian federations to FEI championships, in-house. Princess Haya said she wanted to diversify the FEI's income and create new revenue streams, and move from sponsorship packages to commercial partnerships. "This is a wonderful time for our sport, which is growing around the world and attracting ever-increasing audiences," she said, adding it had been a privilege to serve as president for the past four years. "I would be honoured to have the opportunity to consolidate the gains and the progress we have made in a second and final term," she said. "This has been a time to reflect on learnings and accomplishments, while also exploring ways that the FEI can better support national federations and athletes." She said her programme ideas had stemmed from her conversations with national federations and others in the sport. "Any election is about the future," she said. "It's a time to re-clarify our long-term goals and the steps we can take to strengthen our federation and our sport. "While I'm delighted with how far we've come, there is so much more we can do together, and I'm eager to have the opportunity to continue to lead our federation's transformation." 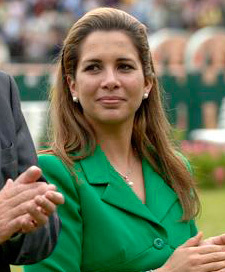 Princess Haya was elected as the 13th FEI president on May 1, 2006. She pledged at the time to modernise the organisation. She listed among her first-term accomplishments a significant improvement in communications, marketing, animal welfare, FEI finances, grass-roots development and liaison with national federations. In her first act in office, she initiated a reform that limited FEI presidents to two four-year terms. Princess Haya said she had limited campaign activity to keep a primary focus on her ongoing work as FEI president, but was now delighted to lay out her vision following the conclusion of the World Equestrian Games in Kentucky. The new president will be elected on November 5. Princess Haya is the daughter of the late King Hussein of Jordan and the wife of Dubai's ruler, Sheikh Mohammed Bin Rashid Al Maktoum. She has been riding internationally since the age of 13 and competed in the 2000 Sydney Olympic Games. She became a member of the International Olympic Committee in 2007 and also serves as a United Nations Messenger of Peace, with a focus on combating hunger and poverty.